As part of Dublin Tech Week, The Digital Hub invites the public to visit our Digital Exchange building to interact with a unique digital art installation created by artist Robin Price. Robin Price (1981) is a British artist practicing across a range of disciplines including electronic music, visuals, audience interactivity and creative technology. Price holds an MPhys in Theoretical Physics from the University of Wales, and a PhD in Composition and Creative Practice from the Sonic Arts Research Centre, Belfast. His creative practice began in nightclubs and electronic music, which continue to influence the aesthetics of his work. A recurring theme in the artist’s practice is the appropriation and augmentation of existing objects. Robin Price likes to play with people’s ideas of what they are and what they could become after a technological intervention. 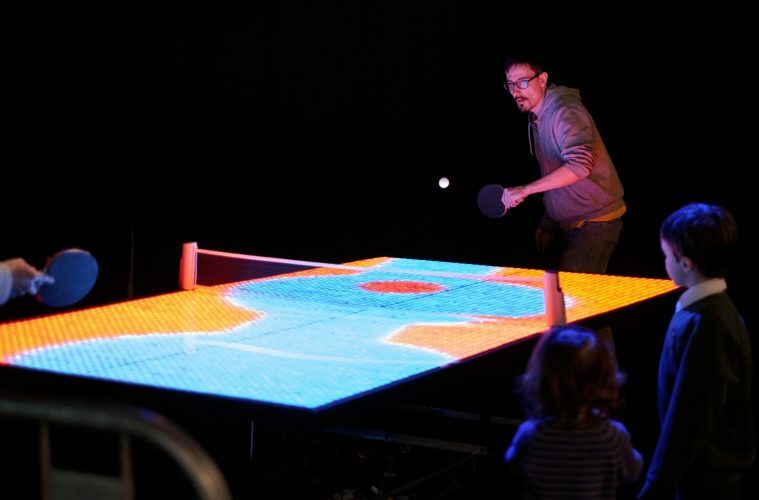 For this piece, Robin Price designed a ping pong table featuring 4000 RGB LEDs under frosted polycarbonate. Each bounce triggers audio-visual effects programmed in code. It was named after a passive aggressive note left in Robin Price’s shared studio space to stop people leaving things on it and as a nod to the surrealist artist, René Magritte.